Dallying In The Dirt, Issue #261 - Cinammon Girl is lighting up my life and garden. I took down the last of the Christmas lights last week. That’s the reason I missed publishing “Dallying” for a week. Those lights are hung in the Euonymus hedge against the front of the house and the hedge needs trimming. That didn’t get done because it was also planting week. All of the Annuals and the Vegetables are now in the ground or in a container and I have time to appreciate some of my efforts. 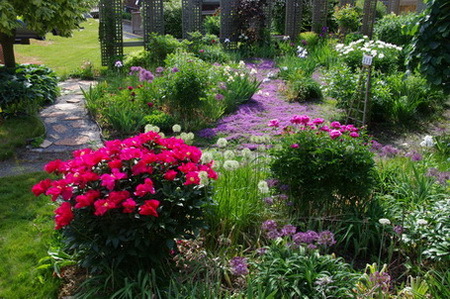 The Peonies are in full bloom along with the Thyme paths and many of the Clematis are a mass of bloom. I love this overview of the front garden because at that distance everything looks great and the occasional weed is not obvious. Tackling them is the next job now that the planting is finished. I had to rebuild one of the Pole Bean trellises because the Morning Glories that share that trellis grew so prolifically last year that the weight of the vines broke the trellis. I’ve moved it back to its former location because they grew massively last summer bur produced very few blooms. The Pole Beans were almost completely lost among those vines. Many of your will notice, America, the large red Peony in the foreground but the real news is the Iris. Those of you who follow me closely will know about my fondness for this perennial and the magnificent tall bearded varieties are in full bloom. In my world nothing else has such a diversity of colour and form while still having a delightful fragrance. They started with the tiny bulbous varieties in March and each new group grew in size until we hit these tall beauties. That’s Cinnamon Girl in the picture and she has a large clump with about 20 bloom stalks this year. In early August I will have ro decide whether she gets to keep that much space and even more or whether it’s her time to be dug up and divided. I have several that should get that treatment this year and I’m always somewhat reluctant as long as those big clumps are blooming prolifically. 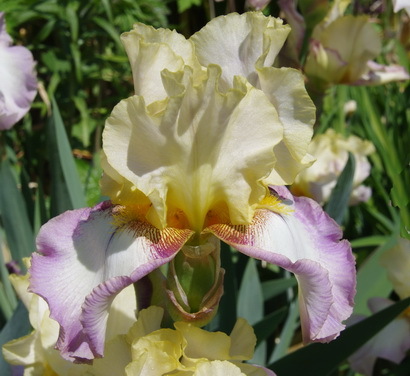 The best reason for digging these large clumps is that it often leaves room for a few new varieties. The sound of my fork in the soft earth will be heard by a few people who just happen to wander by when there are some divisions looking for a home. Gardening friends are wonderful people. Several weeks ago I showed you a picture of sheets of black plastic spread over all the turf areas in the back yard. That plastic was supposed to kill all the grass and more importantly all the weeds. It should have happened in a couple of weeks but to be effective the sun needed to shine brightly to create heat under the plastic. It didn’t. For several weeks the plastic was being lifted in mounds as the grass continued to grow well under it. Then came the week of the heat, 30 C plus and although it was unseasonable it was effective in the turf renovation project. In just a few days the plastic was seen to collapse towards the soil and when I rolled it back it was just a mass of brown lifeless vegetation. Out came the rototiller and the dead grass was torn up along with enough depth of soil to allow me to rake out the hills and valleys to hopefully get the smooth turf surface that was one of the objects of the operation. We will keep it watered for a while until all the unearthed weeds seeds germinate and then they will be knocked down without disturbing the soil and bringing up a new batch. 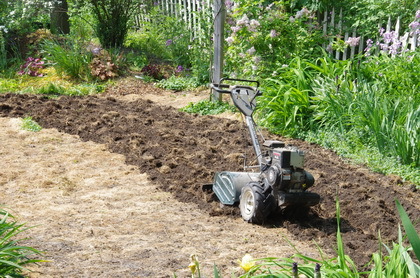 Only then we will apply the grass seed and see if we can get it to germinate well, in the warmth of early summer. Not actually, anywhere near the recommended time for sowing grass seed. I seem to have a penchant for trying to garden against the rules. Ken Answers! It’s always amazing to me, how little I know or stop to think about and my readers are great with helping. Last issue I was complaining about my Clematis that seemed to ignore my trellises. Charlie Comments I believe your trellis is too big for the clematis to climb. Clematis wrap a leaf stem around a thin support to climb, such as a shrub twig or a wire fence. I have had good luck with thin bamboo trellis and a chain link fence that I wanted to hide. Also don't cut the dead wood off of the clematis.